In the Bakery, Annet Gelink Gallery is proud to present the group exhibition Amsterdam Drawing Extended. The exhibition forms an expansion of our participation in this year’s Amsterdam Drawing art fair. Titled ‘Amsterdam Drawing’ the fair’s mission is to show and promote works on paper. This distinction, however, raises the question of how we define what makes a drawing and what sets it apart from other forms of artistic expression. All the works on show in Amsterdam Drawing Extended approach the medium of drawing in differing ways. Ed van der Elsken’s and Meiro Koizumi’s works both commit to film depictions of more conventional drawings, presenting them as documentations of culture and artistic method. The Ed van der Elsken’s photographs on view are part of his 1958 publication Bagara, which documents the cultures and people he came across during his travels through Central Africa. Van der Elsken would often take photographs of drawings as part of his photography books, as he did with Vali Meyers’ drawings in Love on the Left Bank. As such these photographs are not a mere documentation of the drawings, but form part of the wider narrative set out in the photography books. In so doing, they become works in themselves, both drawing and photograph. Drawing is a central element of Meiro Koizumi’s artistic practice. Koizumi approaches the act of drawing as a means to uncover hidden emotional and spiritual motifs that lie behind what is visible, making it inextricably linked to his entire oeuvre. In Untitled we see the artists hysterically whistling the tune of Auld Lang Syne (commonly used in graduation ceremonies in Japan), whilst rubbing pencils across a board to the rhythm of the song. 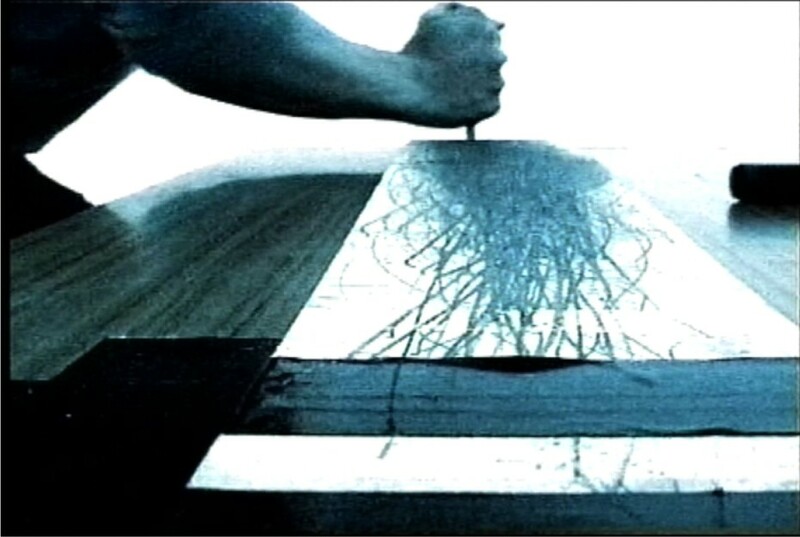 The work conveys a sense of aggression and energy, with the act of drawing becoming a vehicle for the overall outcome of the video work. The works on display by David Maljkovic and Antonis Pittas on the other hand challenge our perceptions of what makes a drawing. Maljkovic uses elements traditionally found in painting to create his Studio drawings. Formed on canvas, as opposed to paper, the viewer is asked to contemplate the process of creating art. Are these drawings to which paint has been added or has the process taken place in the opposite direction? Pittas goes for the inverse approach, using ephemeral graphite on walls, floors and marble sculptures to place texts on otherwise monumental and static objects. Where for Maljkovic drawing is a catalyst for inwardly exploring the workings of art, Pittas employs it as a means to connect art to the wider world. Amsterdam Drawing Extended thus shows how drawing is more than simply “works on paper”. As one of the most fundamental of artistic practices, restricting its definition means restricting its uses. When is a drawing thus not a drawing?